Your Smartwatch MUST be running on WEAR OS. (Not Android Wear). Ensure that you follow the instructions when installing Smartwatch Keyboard and that it is set to 'default keyboard'. 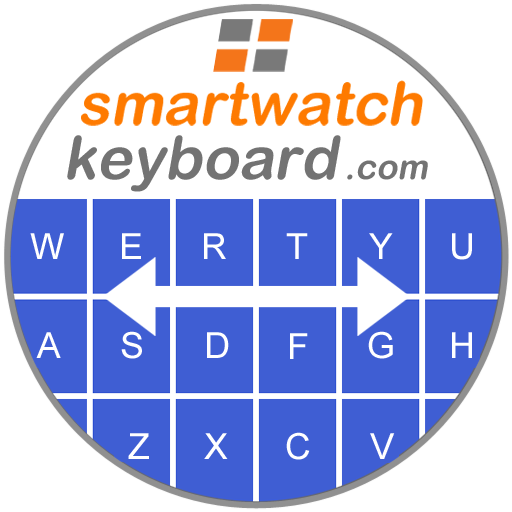 Smartwatch Keyboard (version 1.1.1 >) DOES NOT have Adverts to interrupt and spoil your experience of this wonderful Smartwatch Tool. Smartwatch Keyboard is available in 142 Countries. 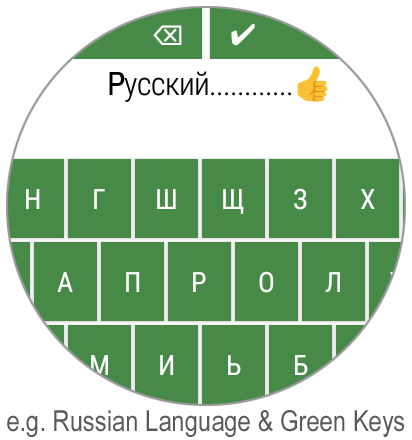 Smartwatch Keyboard has 6 Languages + Abc layout. Asus, Casio, Diesel, Emporio Armani, Fossil, Guess, Huawei, Hublot, Hugo Boss, LG, Kate Spade, Louis Vuitton, Marc Jacobs, Michael Kors, Misfit, Mobvoi, Monblanc, Motorola, Movado, New Balance, Nixon, Skagen, Tag Heuer, Tommy Hilfiger, Verizon, ZTE. 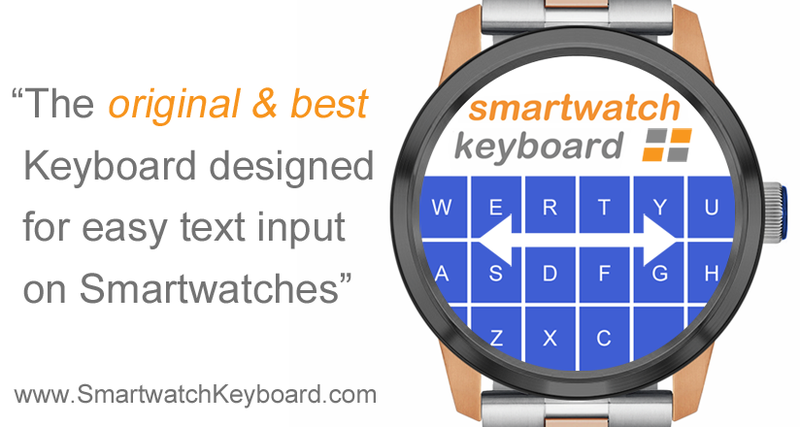 Smartwatch Keyboard for Wear OS (formerly Android Wear) is the "Original & Best Keyboard designed for easy text input on Smartwatches". Smartwatch Keyboard has been created & improved for FREE use by the public and wearable technology engineers. 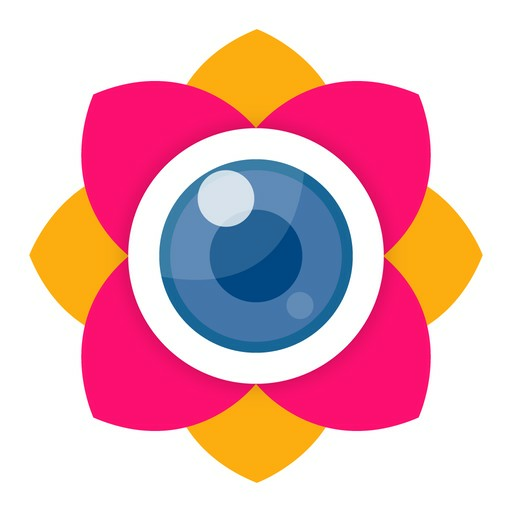 Smartwatch Keyboard is a Google Approved Wear OS Application (formerly Android Wear). 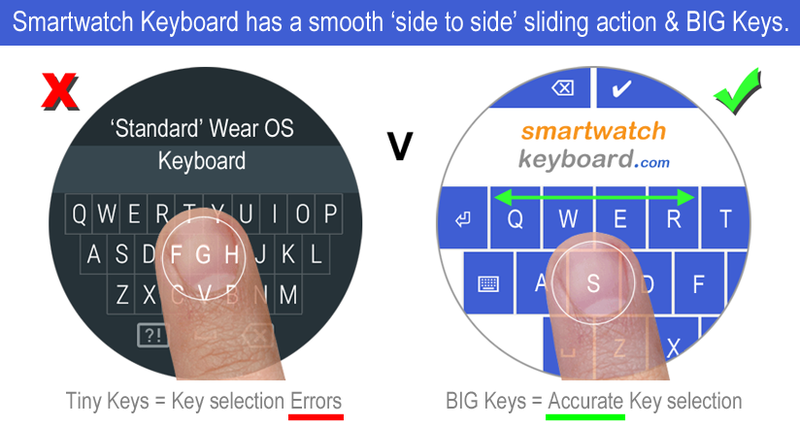 Smartwatch Keyboard for Wear OS slides from Side to Side which enables a much WIDER Keyboard than is normally physically possible on a Smartwatch screen. The result is Keys proportionately much BIGGER & Easier to Select, with the average Human Finger Tip. Medium, LARGE & Extra LARGE. Red, Blue, Pink, Cyan, Green, Orange, Grey & Black. 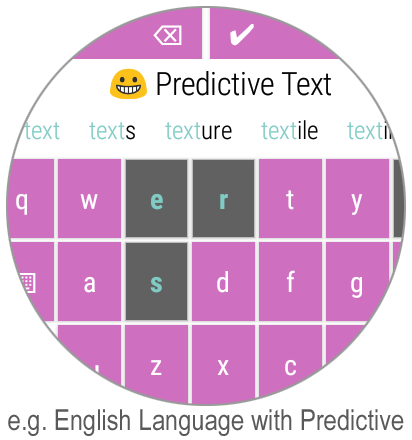 Smartwatch Keyboard for Wear OS has Predictive Text which can be easily switched ON and OFF. When ON, the predictive text displays just above the keyboard & can be easily selected. Note: Predictive text does have limitations, especially when inputting less common words. Smartwatch Keyboard for Wear OS thoughtfully works without auto correction, which is often annoying & irritating. Smartwatch Keyboard for Wear OS has a convenient Quick Text function. This allows you to easily browse a list of pre-made Comments & Replies. It is easy to Add, Edit or Remove Quick Text phrases in the List. This allows you to have more or less Text in view, or you may decide that larger Text is easier to read. 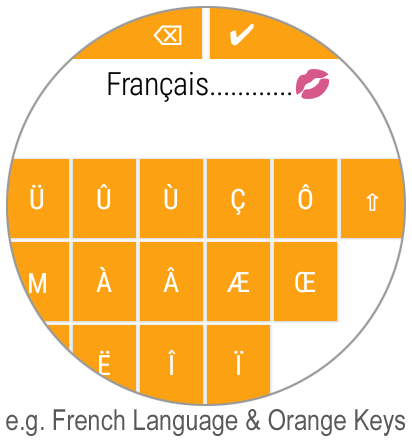 Smartwatch Keyboard for Wear OS has many Colorful & Expressive Emojis that can be easily inserted into messages. 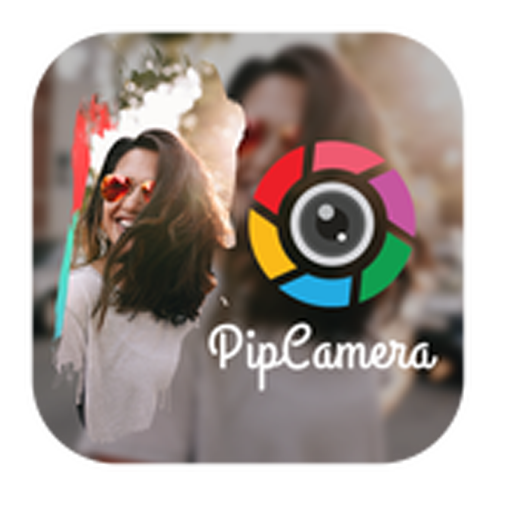 Note: We are working on extra languages and they will be introduced, in no particular order. Smartwatch Keyboard for Wear OS. Smartwatch Keyboard (SWK) Team is based in London UK.